This year’s conference will present the latest opinions within the infrastructure market from key professionals in PPP, project financing and future market sectors such as renewable energy ventures. Through discussions on the latest infrastructure projects in the region, informative presentations and networking opportunities, this premier event will provide an unrivalled gathering of industry’s infrastructure developers, investors, financiers & government agencies in the Benelux region. 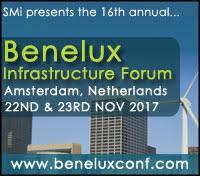 The Forum will provide insight into the recent changes of project financing for infrastructure in the Benelux area and evaluate the new mechanisms of investment such as debt financing, Public-Private Partnerships (PPP), refinancing projects and subsidies such as the European Structural and Investment Funds (ESIF). Other new topics for this year include looking at the challenges of project risk in new markets for enticing investors; issues of increasingly greener regulations on slowing progress for projects; lessons learnt from outside of Benelux such as from the Calais Harbour expansion project; a look into future markets and where investment could be heading such as energy storage, offshore wind and geothermal energy projects; and a detailed look at international investment into Benelux infrastructure.